State-based listicles can be especially silly depending on the topic. For example, over here at PhillyVoice, we've received a couple emails promoting a recent report on shark attacks. The subject line of one of those emails read: "A Decade of Shark Attacks: How Many Has Your State Had in the Last 10 Years?" Our own Brian Hickey pointed out that for those of us living in Pennsylvania, we can be fairly confident the answer is none. Not so, however. A hat tip to Twitter user @nvuono for noting that there has been at least one recorded shark attack in Pennsylvania's history. According to the website sharkattackdata.com, the lone incident happened in February 1961 at the long-defunct Philadelphia Aquarium at Fairmount Water Works. A 30-year-old Charles Peterson reportedly had his thumb lacerated by a shark in a non-fatal, "provoked" attack while cleaning a tank at the aquarium. Sharkattackfile.net has a newspaper clipping of an Associated Press story on the incident that ran in The Bee, a Danville, Virginia, paper. The story states that Peterson, an attendant at the aquarium, was pushing silt toward the drain of the tank with a pole when a sand shark leaped out of the water and injured his left hand. Ten stitches were needed to close the wound on his thumb. 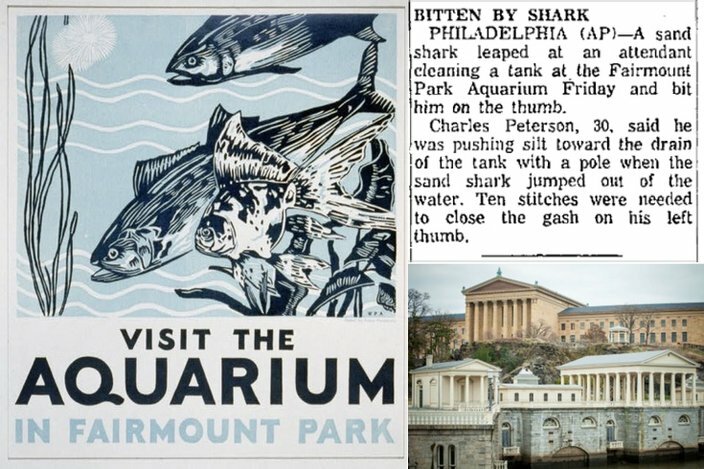 Pictured left is a 1937 poster promoting the aquarium at Fairmount Park, via the Library of Congress. Pictured top right is a newspaper clipping about a 1961 shark attack on an aquarium attendant, via sharkattackfile.net. Pictured bottom right is a photo of the Fairmount Water Works taken by PhillyVoice photographer Thom Carroll. The aquarium would close only a year after the incident and would be converted into the John B. Kelly Pool — an indoor practice pool for competitive swimmers, not to be confused with the current outdoor pool of the same name in Fairmount Park. The indoor pool closed in 1972 after it was flooded by Hurricane Agnes. While the Philadelphia Aquarium incident is the only case of a shark attacking a human in Pennsylvania, sharks have been spotted in the state in the past — or at least on its border. As PennLive has noted, newspaper reports cite a 12-foot shark of the "man-eating variety" that was shot and killed by a man in the Delaware River near Tacony in 1922. Additionally, in the summer of 1960, so many sharks were spotted in the Delaware River that authorities issued warnings for beaches along the river. That's about it for Pennsylvania, however. If you want the Shark Week-worthy stuff, you're going to have to head over to Jersey.